As you already have likely noticed I (way more than Abisaac) have been a bit lacking in the memory department lately. I could blame "baby brain" or lack of sleep or maybe I'll just be honest and say that I seriously just must have forgotten. Either way, it has come to my attention recently that we did not have a post yet about the wonderful Edmonton based family owned restaurant Yianni's Taverna. This is truly a surprise to me because we have eaten there often and always really enjoy everything...the food, the atmosphere, the liveliness of the entire place are all great! Recently we received an email from the restaurant asking us if we would write a post about the gluten free options available. Of course we happily agreed to, especially since we've been there numerous times and I always order one particular item, the Briam Ratatouille. I just love it so much, why change when it's always awesome? Now, I am definitely not vegetarian, but I just can't get enough of this lovely flavor filled dish. I admit, I can never finish the whole portion and always take at least half of it home with me, but I just think it's the best! I have even called ahead to ensure they have some before going down to Whyte Avenue to Yianni's restaurant. So here's the list of completely gluten free foods on their menu followed by the list of things that can be modified to be gluten free friendly. All of the dips are served with pita, but vegetables are substitutable upon request.Demetris salad without the pita chips is an easy modification.Bouyourdi is served with pita...they can give you some rice instead of the bread. I must tell you all that I/we were truly touched to hear that a customer informed Yianni's that they use our blog Gluten Free Edmonton as a guide for where to eat (gluten free safely) in Edmonton and as we had not written about this restaurant they were hesitant. 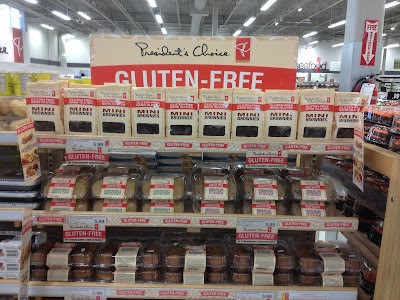 Way to go Gluten Free Edmonton (big pat on the back happening over here). Thank you from the bottom of our hearts to everyone who reads and enjoys our blog and to those new comers out there, we hope you find it helpful when searching for information, resources, ideas and meal planing tips related to gluten free living. I while back I was contacted by Gerry Semler, the General Manager of Bon Ton Bakery in Edmonton's West End. He was beginning to see the demand of gluten free baked goods, and wanted to let us know that they were increasing the number of gluten free products they are carrying. 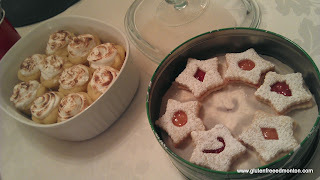 Some of the products are locally sourced like Totally Gluten Free Bakery in Lacombe and Happy Camel here in Edmonton. Others are your usual suspects like Bakery on Main, and Udi's gluten free breads. Below is a list of products they are carrying. Note, like any place to shop, selection can change as new products are introduced into the market etc. This is going to sound like an infomercial for Simply Supper, but truly its not! First, what is Simply Supper? In my opinion, it is a place for people that have a lot on a go, and need great tasting, easy to put together meals available. How it works is that every month Simply Supper has a new menu of just over a dozen meals. You buy a package of x amount of meals, and Simply Supper does all the prep work for you for the meals you choose. They source all the food for you, they do all the cutting of the vegetables, make the sauces etc. 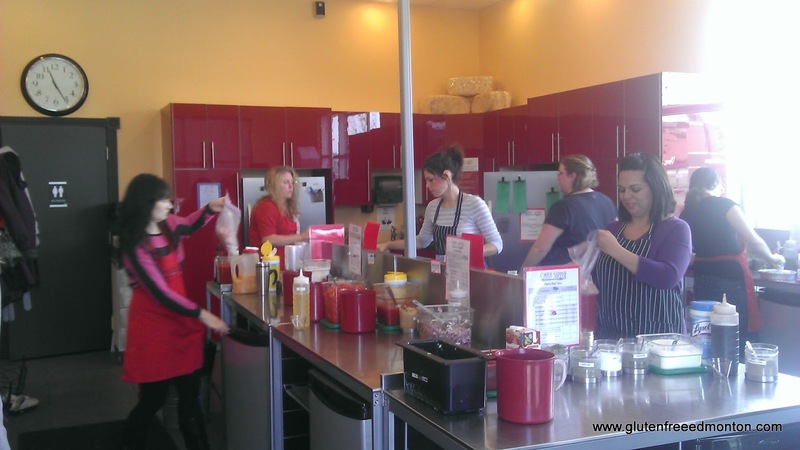 The store is setup with stations for each meal, with a list of ingredients you need for it. 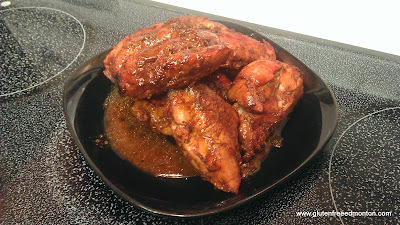 You ziplock x amount of chicken, x amount of sauce etc, put it in a bigger ziplock with pre-printed cooking instructions. Take it all home and freeze it. The day before you want the meal, you take it out of the freezer to thaw it out to cook the next day. Typically each meal takes about 20-30 minutes to cook because all the prep work has been done already. I'll admit, at first, Amanda and I were totally skeptical about this business model. We had the mentality that "oh we can just do this at home". So why did we try it? Well, it was my employers idea. Or more of a thoughtful gift they got us after my brother passed away in September. I don't know but for some reason, when you are mourning a loss, people feed you like crazy. I guess they don't want you to forget to eat. My office knew I was in Toronto attending to my family and my brothers affairs for two weeks. So that meant that when we got home, we would have nothing in our fridge, and no meals prepared. So quite thoughtfully, they went out to Simply Supper as an office, and packed up a dozen meals for us. My office did their due diligence and asked about gluten free meals, which are all marked on Simply Supper's menu. They either say IT IS gluten free, IT CAN BE MADE gluten free, or IT IS NOT gluten free. When you schedule your time to put together your meal (or you can pay a small fee to have them do it for you), you make sure you let them know it is a gluten free meal, and they will tell you to follow the the gluten free guidelines. Simply Supper, sources gluten free pasta's and gluten free flours etc. when needed. So how have we found the Simply Supper meals so far? Fantastic, infact we had gone back to pick up a few more already. Not only are they easy to make, but they taste amazing too. So that whole "oh we can just do this at home" shpeal, becomes not as true anymore because Simply Supper knows how to put a good recipe together. And "doing this at home", certainly takes away the convenience of it all. Obviously some meals are better than others, but our two favourite meals so far were from the September menu when this was gifted to us. 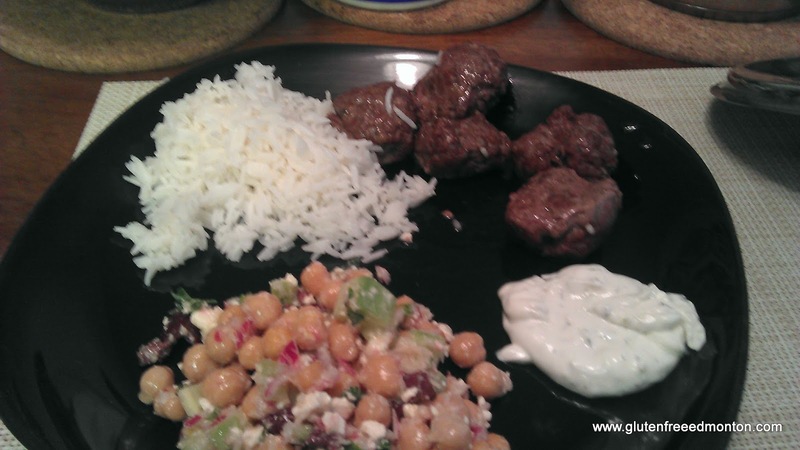 They were the kofta's (turkish meatballs), and tandori chicken. You would think these were restaurant meals. We have also tried the maple chipotle salmon, firecracker chicken, chicken courdon blue with gluten free pasta and a few others. Simply Supper is located at 23rd Ave. and Rabbit Hill Rd. Hope you enjoy! Kinnikinnick Foods in Edmonton has had a great week as reported by Global TV Edmonton. Kinnikinnick recently received a $1 Million investment from the Canadian's Harper federal government through Canada's Economic Action Plan. This will help Kinnikinnick invest in new equipment and hire more staff in order to keep up with demand. I guess Kinnikinnick is growing more! Way to go! I love to hear Canadian success stories like this. Kinnikinnick recently presented at the annual general meeting for Canadian Celiac Association Edmonton Chapter. It was great to hear about how Kinnikinnick started as a stand at a farmers market and has now grown to what they are today, one of the largest, and one of the best gluten free bakeries. Kinnikinnick already holds great market position in Canada and the United States, and looking at overseas markets is certainly not out of the question now. I'm hoping this investment also helps them to serve the food services industry more so people with Celiac Disease can go out to restaurants and eat safely. All the best to Kinnikinnick and your future endeavours. Thank you for making great tasting gluten free products, and serving the Edmonton Celiac community well with a great fresh bakery. We still think your gluten free cupcakes are the best we have every tasted (and I mean as a cupcake in general). Hip hip hooray for a gluten free menu option at a kid friendly restaurant! I don't know how this got by me, but I read it on About.com, that Chuck E. Cheese's now has a gluten free pizza available for people with Celiac. And guess what? It actually seems pretty safe. Check E. Cheese says their pizza's are pre made and baked a gluten free facility and shipped packaged up to each restaurant. They are a individual size gluten free pizza for $5.99 and an individual chocolate cupcake for $1.99. 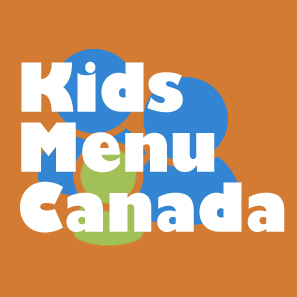 This is great step for a kid friendly restaurant. I don't think there are many child friendly places that accommodation a gluten free diet. I can imagine kids with Celiac Disease no longer have to decline an inviation to a birthday party at Chuck E. Cheese's, or now they can even have their own birthday there! Awesome. 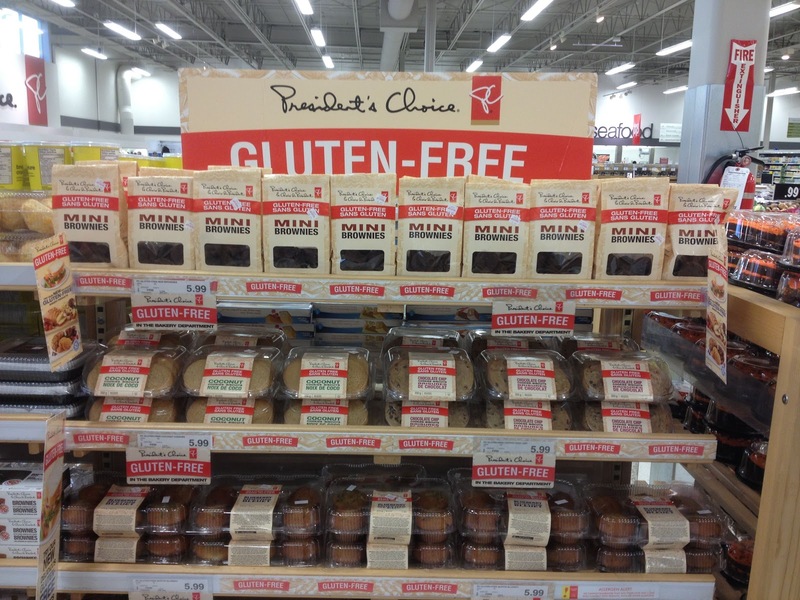 500 locations across the United States and Canada will be offering these gluten free options. Check out their YouTube video below and click here for more information about Chuck E. Cheese's gluten free options. 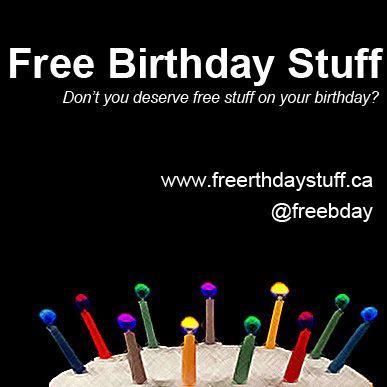 It has been confirmed that the Edmonton locations already carry the gluten free pizza and cupcake. See comments below. The other day we had dinner with our Celiac friends. Which meant, we got to have a gluten free style potluck! 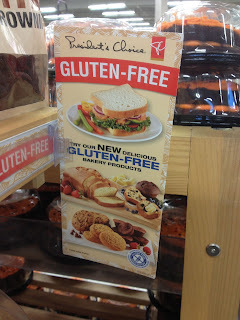 Which meant no worries of cross contamination for Amanda and our other friends with Celiac. The result? A great night, with great friends and of course great food. We have written about potlucks in the past. 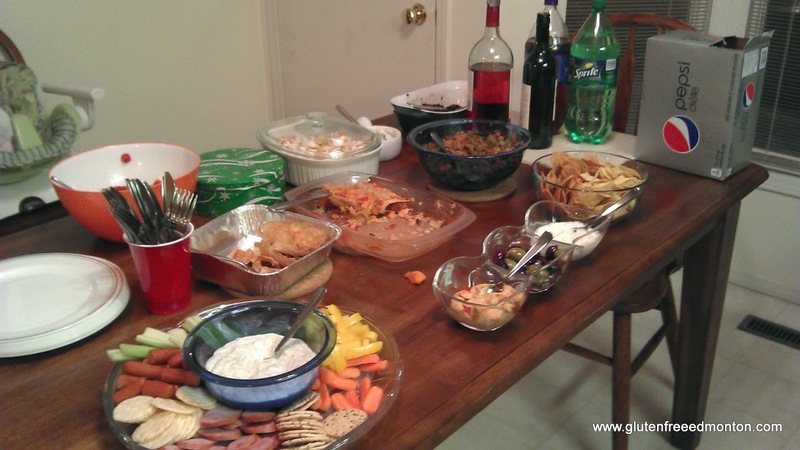 But we wrote about hosting a potluck with non-celiac's, but not a strictly gluten free potluck. So what's the difference? No worries about cross contamination. Now that was a big deal for the Celiac's at our house. Dani put it best when she rushed to the table to start picking at the food first. She first apologized for barging her way through, because she is so used to doing that at potlucks, because she wants to get to food before any cross contamination. But guess, there was no need, because everything was gluten free! So on the featured menu items! "Birthday Salad" By RL, unfortunately, we thought we wrote about this one, but didn't. So it will follow later. I totally forgot to snap a good shot of the food at the beginning because everyone charged the table so quickly. The food all looked so good! And it was. I recommend all the recipes. During the Summer I was quoted in an article about the need for more gluten free options at Edmonton festivals. I called out people to pass on the article to festival organizers to show them the need. 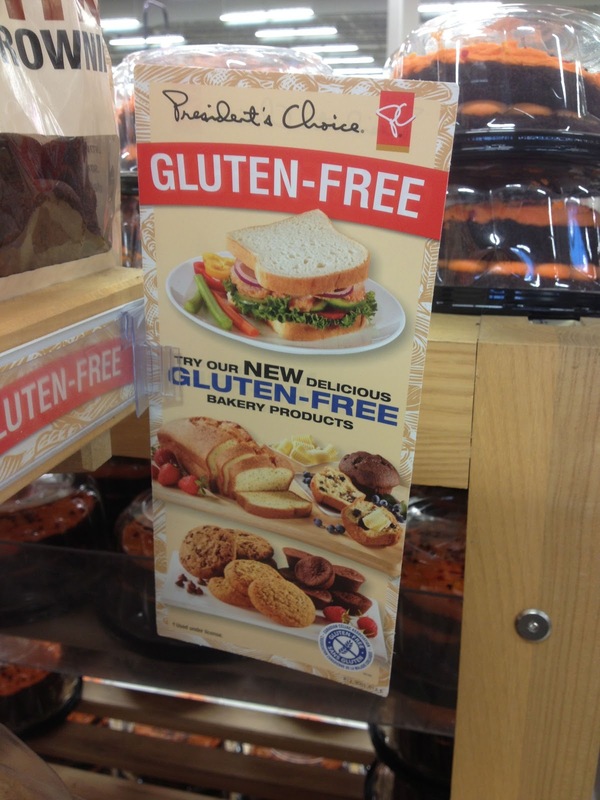 Certainly will help spread the word of Celiac Disease and the gluten free diet. Shortly after I received an email from a gentlemen named Doug. His alternative was to eat at restaurants instead. Obviously not his first choice, he would rather be able to take his daughter to the festivals. Great thing is that he became a great ambassador for gluten free foods at restaurants because he has a stake in the Wildflower Restaurant at the Matrix Hotel in downtown Edmonton. What does this mean? It means we have someone that understands the trials and tribulations of the gluten free diet and eating out behind the scenes at a restaurant. He knows what a gluten free diet means, and he wants the restaurant he has a stake in to accommodate the gluten free diet. Fantastic! At Wildflower all sauces, demi glaces, etc. are prepared from scratch. Because of that they know exactly what the ingredients are on every plate. 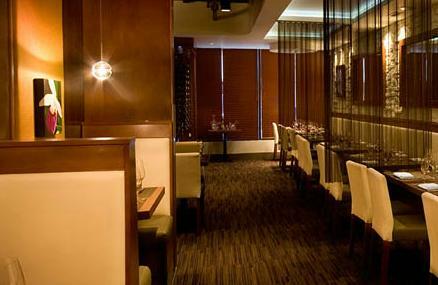 It is expensive, but it is fine dining. The head Chef is Nathin Bye who recently won the Gold Plate competition and the restaurant has won a number of awards. The restaurant always does an outstanding job meeting his daughter’s needs. Know anyone else that has a stake in a restaurant that is willing to write in how they accommodate the gluten free diet? Have them write us at info@glutenfreeedmonton.com. You all know that in September my brother Daniel Saraga of Haggis and Herring recently passed away. I've struggled to think about how can I tribute my brother. I never know if I am doing too little or too much. But I have talked with a few people and know that there is only so much I can do to tribute and remember my brother. I have two things in mind. One is private to me and my family. The other, is to participate in Movember (formerly known as November). Why Movember? Well, every year my brother would put away his shaver and grow a mustache. He was in it to promote men's health. After all, Movember is not just about raising awareness about prostate cancer, but men's health in general. And my brother always took care of himself, always went to the doctor when he was ill or felt like something was wrong. So I thought I would tribute my brother by promoting men's health. I my self have not been good about going to the doctor. So I thought, if I am going to participate in Movember, I have to book a complete physical, which is now booked for December. So, what I am asking for? First, and most importantly, if you are a dude, book your annual physical Get yourself checked out because you don't have to wait to get sick to see a doctor. If your a female, get your loved one to check themselves out. Secondly, Movember has grown and brought to light men's health, and has done a good job at having men talk about their health and even ensure men start to take care of their own health. So make a donation on My Mospace, so Movember can continue its campaign for Prostate Cancer Canada, Awareness & Education, Global Action Plan and Canadian Male Health Network. Click here to make a donation on my MoSpace.